This is the time of year we look back and consider what we’re thankful for. I am thankful for the opportunity to be well-published. I have always enjoyed sharing my knowledge with others and I have done so for well over 20 years now. What started as chapter work for the first Oracle Unleashed work has flourished into 14 books, hundreds of printed articles, and thousands of blog posts. Being published has landed me very well-paying positions, and has been the catalyst of my world travels (Oracle University Celebrity Expert Lectures, my own training business/training courses, and guest expert at user groups around the world). So…how did I get there? Was it what I knew… or who I knew? And what did I learn along the way? This article will give you a little background on how I became a book author and a regular blogger (along with being a movie star: published video of many of my courses). Maybe you can use some of this information to jump start some new endeavors in your own career. I have been the president of the Iowa Oracle Users Group for years. I founded the group back in the early 1990’s. I have written for a number of publishing companies but mostly for Pearson Education. Click here to see my recent titles on SafariOnline and click here to see my books, including my self-published books on Amazon. Here’s how it all started: Working at my DBA cubical job one day in 1995, I receive this call from Sams Publishing (a subsidiary of Pearson Education) to help complete a couple of chapters in the first book in a series: Oracle Unleashed. I did the work quickly and earned myself a key role in the second edition as well as other Oracle Unleashed topics by Sams. The work on these books lead to article work for Pinnacle Publications (acquired by K-Journals a while back), where I was one of their key contributors. As the internet progressed, I became a blogger, and all of this work has me working on my current writing assignments for Toad World! Being published is more of knowing the right people, or, where to start. In my world, the project has always gone better when it has been their idea. You have to get published first and the first one will open the door of opportunity. Before you start writing anything, you need a book idea and a publisher to agree to work with you on the topic. They will ask you for a table of contents (TOC) and if this is your first or second time being published, they will ask you for a chapter. DO NOT write the entire book then go and look for someone to publish it. Being published just doesn’t work this way. Companies to contact include Pearson.com (Sams: Informit.com/sams) and Oracle Press (www.Osborne.com). The pocket references are produced by O’Reilly (oreilly.com). There are many others. Just look up your database of choice on a Google or Amazon search and reach out to those publishers. The above-mentioned publishers are ones I am working with or have worked with in the past. Once your TOC is approved, the contract phase starts. They will want everything yesterday, if not the day before! Make sure you have time to meet or preferably exceed your deadlines. Much like car payments, if you are going to be late with material, let them know ahead of time. There will be provisions and penalties spelled out in your contract. So…when negotiating deadlines give yourself enough time per chapter. Make sure to ask for a dozen or more copies of your book. They can give these to you and it helps to get the books if the count is written in the contract. Your relatives will like seeing your name in print. I like seeing my name in print. They are great to take along on job interviews. I use them at speaking slots at trade shows and user groups as a give-away item (book draw). ***Tip*** I have taken my latest book with me on job interviews, leaving it behind with my resume. It REALLY helps to be early with any deadline. I never like to keep my publishers waiting on me. After you are done with the agreed-upon material, there will be a lag of four to six weeks. Then the chapter reviews will begin. Again, they will want you to review their questions and suggestions and get your comments back to them ASAP. Again, they prefer you get your review back to them yesterday. If your topic is a technical one, there will also be a technical edit of your material. Sometimes they will ask you for help finding someone to do this work. They will pay them to review the chapters as well. I have actually been this review person more than once. Be sure to ask for a copy of the final material. Pictures and images have been an issue for me. I just hate rework of any kind. Make sure to work with the publisher after contract approval and before you start taking screen shots for your material. They have a specific pixel specification they will take. They also have a naming convention for everything as well. They should ask but if they don’t, insist upon supplying some sample images and make sure they meet their approval. ***Tip*** Make sure your images look good in grayscale. I use a product called Snagit by techsmith.com. You can adjust the colors and pixels easily with this tool. Sometimes the settings are from your computer’s screen settings. Your publisher will help you produce the correct images. I have had to reproduce all the images before, this is not a lot of fun…and again…they will want these yesterday if not the day before. The book will take about two months to produce. Another avenue I have done (four or so books…) is self-publishing. This method of being published is far easier to undertake, but more difficult to market. 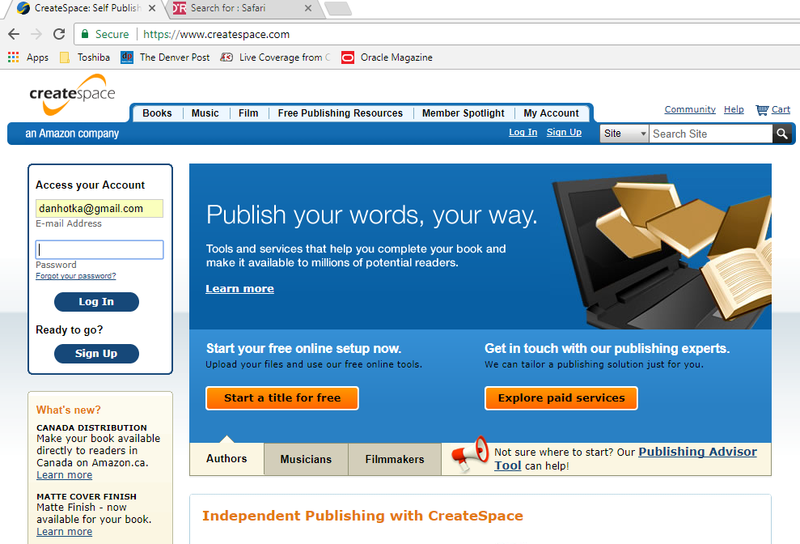 I use createspace.com. This is an Amazon.com subsidiary and your published books automatically appear on Amazon searches. I can order the books for my on-site classes at a greatly reduced cost. People have ordered the books from Amazon as well. I have used this site to produce the rough equivalent of a pocket reference book. 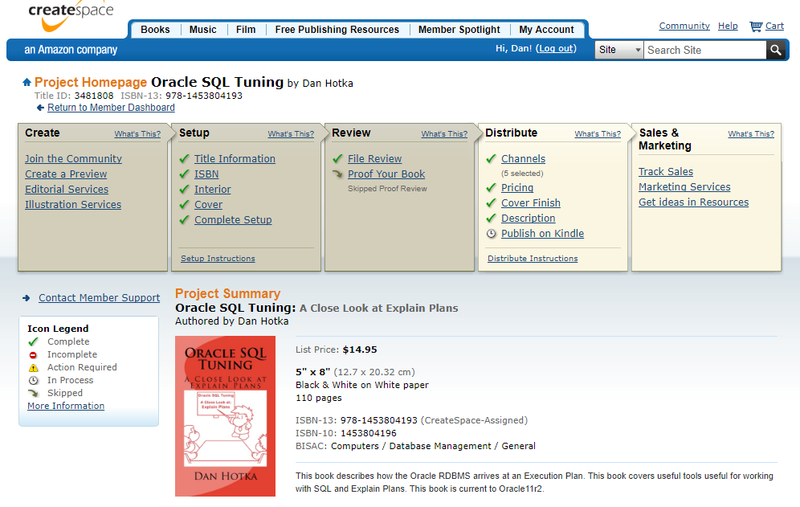 I have produced these for SQL Tuning topics and Toad Tips. I have selected one of their templates as a standard for my self-publishing books and created each of them in a different color cover but with the same appearance otherwise. I use pretty much the same process as publishing companies to produce these. I start with a table of contents, then do the chapter work. Make the images as large as possible using a product like Snagit (by techsmith.com). The website walks you through the entire process. The Setup stage will give you the ISBN number and allow you to select a cover. The Interior allows you to upload a word document. Basically, they take a Word document for the content. The site is quite picky about margin size and page layout, depending on the size of book you select to produce. ***Tip*** Ask me for my Create Space book template. I have already laid out a word document that works well for a 5x8 inch book. You can review the errors and comments from their electronic review and you can order proofs so you can review an actual hard copy. These arrive in the mail quickly. You can see under the Distribution tab that you decide on the pricing. Under this area, they will let you know what it costs to produce and mail the book. This tab also allows you to have your book produced in Kindle format (far less expense for CreateSpace). The last tab is where you can order copies for your needs at a reduced rate. I always take a couple of these books to do book draws at my user group and trade show speaking slots. People love a book draw and this has proved to be a good way to market your book as well. You don’t get rich writing books. You can do quite well in your career being published, though. One book will lead to another. The blogging people (such as ToadWorld) prefer people who have been published to do their blogging. My career excelled through the 1990’s and I attribute most of this success to being well-published (along with being at the right place at the right time with the correct skillset). Being an author has gotten me paid invites to most user groups, including Oracle Open World. Being an author has also gotten me the jobs and positions I’ve enjoyed and this success continues to fuel my training business today. I want to thank my past and present publishers. I have enjoyed writing each and every topic I have produced. They have worked with me time and time again. One writing project has always led to another. Being published has probably been my best career move. I am truly thankful for the opportunity to be published.